The Golden Temple of Amritsar, in west India, near the Pakistani border, is Sikhism’s most sacred religious site. It hosts about 100,000 visitors daily and on a 24-hour basis. The courtesy, gentleness and sense of hospitality that the visitor encounters in conjunction with the reverence of the pilgrims under the melodic Kirtan chantries, conveys your soul into another dimension. We decided to enter the queue of the pilgrim crowd, moving slowly for an hour onto the bridge leading to the center of the lake, inside the Golden Temple. We were offered a privileged floor seating for a while, in front of the sacred book surrounded by the Gurus and the singers with traditional instruments in a devotional, energetically charged atmosphere. Around the lake there are many other buildings, such as the whitewashed Akal Takht which is the center of the religious authority, as well as the langar (kitchen) where -as in every Sikh temple- free vegetarian meal is offered to all, practically eliminating hunger of the poor. 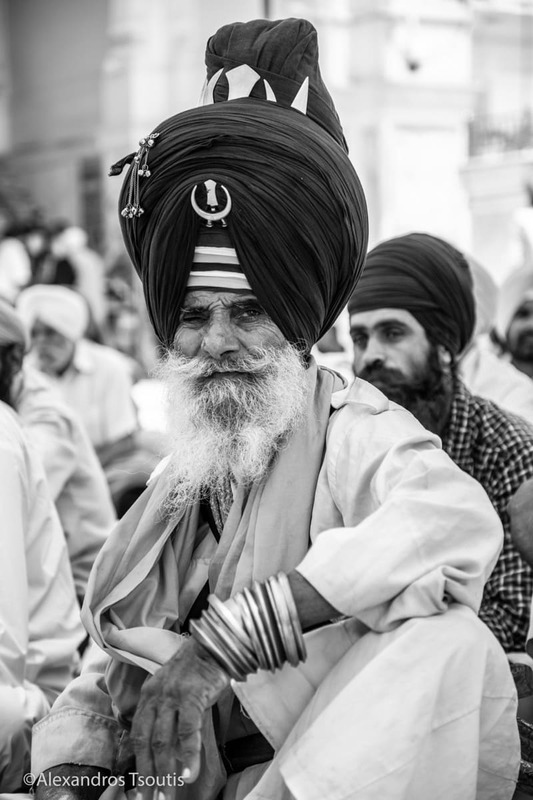 Sikhism is a monotheistic religion starting in the 15th century in India. With influences from Hinduism and Islam, teaches a disciplined life in search of spiritual salvation in the name of God, discarding the “Five Thieves” of human sense, composed of conceit, rage, greed, attachment, and lust. The faith follows the teachings of the 10 enlightened Gurus and the sacred book of scriptures. After the baptism on the sacred ceremony of Amrit, they take the anointing of purity (Khālsā), which commits following of the five Ks. Hair Cutting: Each Sikh must keep his hair uncut without any scissors use. Intoxicating: Drinking alcohol, drugs, tobacco, and other toxic substances are not allowed. (there is an exception to using cannabis for meditation). In temples it’s forbidden for everyone to carry tobacco products. Adultery: Spouses must be physically and mentally loyal to each other. Meat consumption, especially derived from an animal slaughtered by the Islamic method of throat-cutting and prounouncing the name of Allah. There are exceptions here too. Priesty class. Every Sikh can sing hymns, officiate marriages, serve in temples and read the sacred book of “Guru Granth Sahib”, who is also considered as the highest, living Guru. The Sikhs are considered brave, self-denying fighters, and the Indian army regiment they are staffing is the most decorated. In the years 1983-1984, an armed subversive movement occupied and fortified Amritsar’s Golden Temple, converting it into a shelter of extremists. After months of fruitless negotiations and ongoing killings, on June 1st 1984, Prime Minister Indira Gandhi ordered a bloody 10 day “Operation Blue Star”, leaving hundreds of dead. Five months later, she will be assassinated by two of her Sikh bodyguards.